Merle Squirrel welcomes you to our September page. He loves the season of fall, especially when he can gather acorns in the fall. He loves to play in the leaves, sing in the fall rain, and scamper around the yard smelling the smells of Autumn. Fall/Autumn -- time for nature walks. 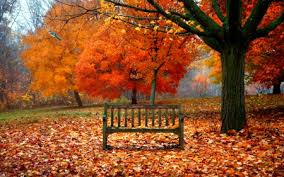 Is there a park near by, or a street with colorful fall trees? On a clear day set a time in your schedule to experience the changing of nature. Give each student a paper sack which they can put save any treasures that they find on the walk. Acorns, colorful leaves, interesting rocks or stones, any thing that interest them. Talk about what they see, hear, smell, feel by pointing out the colors of the leaves, blues of the sky, crunch of their feet in the dried fallen leaves, feel the breeze, hear birds songs, etc. For the sense of taste find a place to stop and serve apple pieces. When back at school do a circle time, letting each student who wishes to, tell how they used their senses. Fun classroom Activities using leaves. 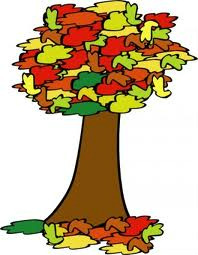 When out walking encourage student to collect different kinds of leaves. (Choose those not dry or crumbly. Arrange up to 4 leaves on a smooth surface. Put a thin sheet of white paper over the leaves. Use a crayon (red, yellow, or brown) to rub gently over your paper and leaves. Watch the outlines and vein lines or hour leaves appear on your paper. 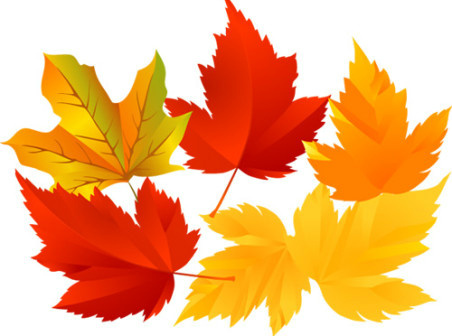 Have student choose the most beautiful and prefect leaf she/he has found. Place a towel on a table where the student can reach. Arrange the leave between two sheets of waxed paper on the towel. (Teachers preheat iron on low heat. Supervise students at all time on this project.) Let older children iron the waxed paper. (You will want to help the youngest ones hold the iron while you push the iron.) The iron will seal between the wax paper. These pressed leaves can be framed with strips of construction paper and place in the school windows or displayed around the classroom. Tape several leaves (of different shapes) on dark brown construction paper. Leave the paper with leaves on the windowsill where sunlight will bleach out the paper. In a week or so take the leaves from the paper and you will have a silhouette of the leaves. If you are lucky you may see a squirrel or two. Watch them as they skitter and climb. (if you have a camera, which every teacher should carry on walks) try to get a picture of it. Display it on your photo board. 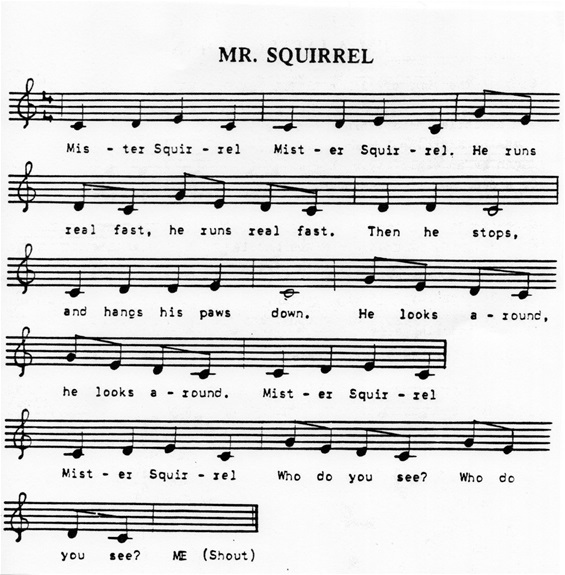 When back in the class room teach the students Merlw Squirrel's fun action song, "Mr. Squirrel." Directions: (Mr. Squirrel, Mr. Squirrel. He runs real fast (repeat) wiggle fingers as if they are running. (Than he stops) palms up - fingers point up. (And hangs his paws down) Hands bent down at wrist. (He looks all around, he looks all around) turn head from side to side. (Who do you see? Who do you see?) Continue action. (ME!! ) Point to self. Color page. 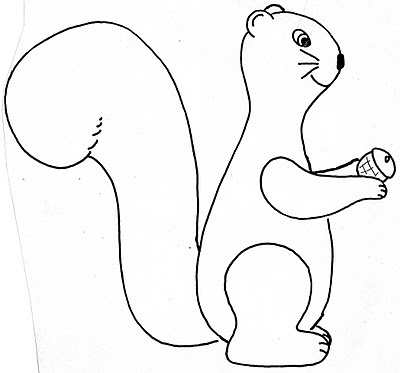 For a movable squirrel copy squirrel and make pattern from arm, leg and tail. Cut out one body, two legs, two arms and a tail from brown or grey construction paper. Use paper fasteners to put the pieces on the body. 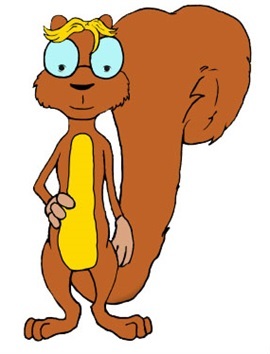 A great book to read after your experiences with Mr. Squirrel. 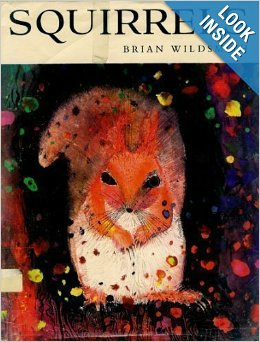 "Squirrels" by Brian Wildsmith. A Library Binding used book can be found on Amazon for around $6.00. students at the first of the year and only the teacher uses it. time and be sure you give it a name that will interest the students. 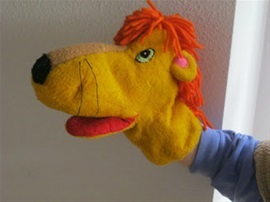 Meet out teaching puppet, Lindy Leo Lion. 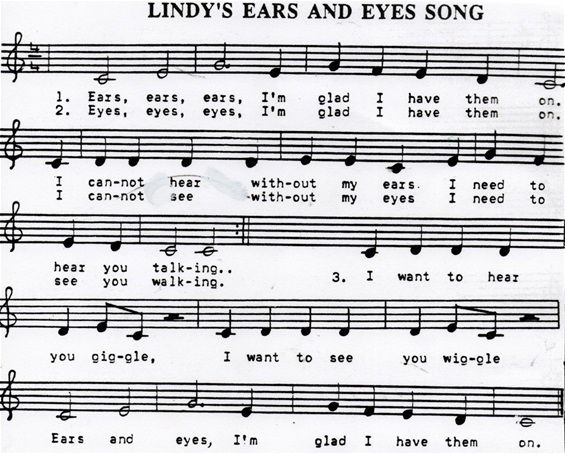 Words to the song, Lindy's Ears and Eyes Song. Verse 1: Ears, ears, ears, I'm glad I have them on. I can-not hear with-out my ears. I need to hear you talking. Verse 2: Eyes, eyes, eyes, I'm glad I have them on. I can-not see with-out my eyes. I need to see you walking. I want to hear you giggle. I want to see you wiggle. Ears and eyes, I'm glad I have them on. What is more fun than finger painting? Most students like to mess with ‘squishy’ paints they can really get their hands into. there are various recipes for finger paint. I like this recipe which can be made with household supplies. Mix cornstarch and ¾ cup of the cold water in saucepan. Place gelatin in the other 1/4 cup of cold water. Pour the hot water over the starch mixture and bring to boil over a medium-hot burner. Stir constantly until mixture is clear. Remove from stove. Stir in watery gelatin. Add soap flakes. Stir until all soap is dissolved and mixture is thick. Smear brown finger paint on a cookie sheet. (Can use a large plastic meat tray for easy discard.) This is a messy project so have students wear paint shirts that cover their clothes. Place child’s arm, from elbow to palm in paint, palm down with fingers spread. Carefully lift child’s arm and press it on a length of freezer paper. Have a pan of water and towel near by so student can wash off their arms. Remember to put name of student on their arm print. Put aside to dry. 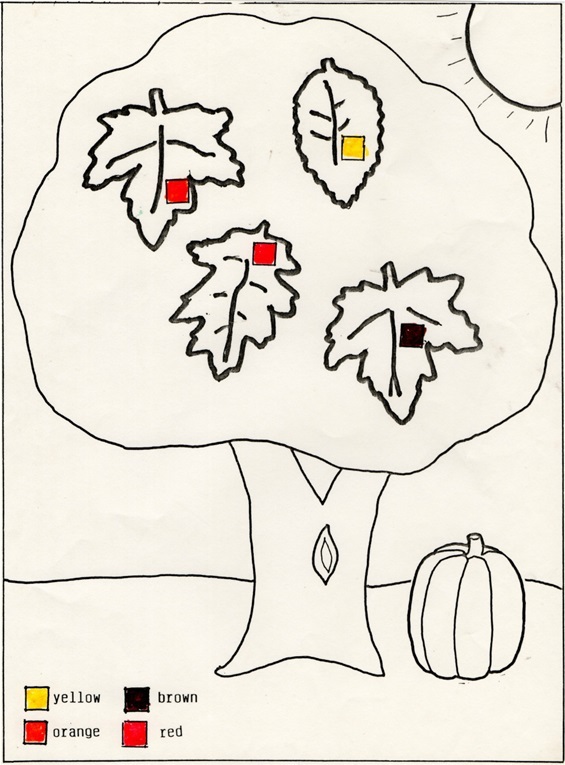 When print is dry, Let student finish their ‘Fall Tree” by dipping a finger in red, yellow, and orange finger paints to make leaves on the tree branches. Dry and display in the room. **Note: If you have children who do not like to get dirty (YES there are some! ( ) have a paintbrush handy and let them use a paintbrush to make the tree without getting paint on their arms and fingers. Color Match page: Review color words with students. Have them find the correct crayons from their box. Color the leaves that match the color boxes. Finish coloring with their choice of color. Of course every student's masterpiece should be displayed for parents to see when pick up time comes.